Pippin wants to be a real boy and he needs your help. Click here to play! Help him find the blue fairy in order to make him a real boy and you will be rewarded handsomely for your efforts! As you're going to be helping Pippin in his quest, you'll need to stick close to his side. His symbol acts as a substitute and will replace all other symbols except the scatter. He will also expand across all three rows to help you create more winning combinations. You should also keep an eye out for the cuckoo clock as five of these across a pay line will get you 1000 times your line bet. The sly fox will be looking to lead Pippin astray so keep him under close watch. Three to five of him on a pay line will get you up to 500 times your bet. 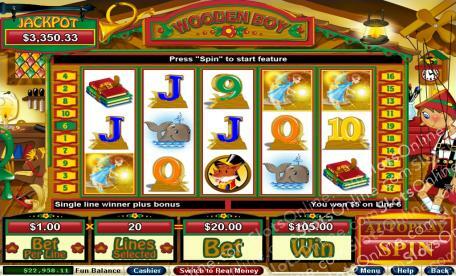 Whales and Pippin's books will also help you, each paying out up to 250 times your bet. If you can find the illusive blue fairy, Pippin's dreams will be answered. So will yours. This little nymph-ish creature is a scatter. Three to five of her anywhere on the board will trigger a feature that awards you with a number of free games. She will also multiply your total bet. Can you help Pippin realize his dreams of becoming a real boy? The blue fairy acts as a scatter. This little creature will trigger a feature that rewards you with a number of free games. During these free games, if Pippin appears all prizes will be tripled. The blue fairy will also multiply your total bet. Pippin, the wooden boy, acts as a sustitute. He expands across all three rows to replace all other symbols, excluding the scatters.